The Cookie Elf File is the Elf’s free collection of easy cookie recipes and cookie baking tips. The File is designed to make baking cookies easy and fun for you. About once a week, The Elf emails a new edition to more than 3,500 subscribers. Join them! The tips make baking cookies simpler. Sign up now to receive The Cookie Elf File, and you’ll get a free copy of 6 Easy Cookie Recipes. These recipes are so easy that they can be in the oven in 10 minutes or less. They are favorites with kids, families, and anyone who likes cookies – whether you’re experienced in the kitchen or you’ve never baked before. 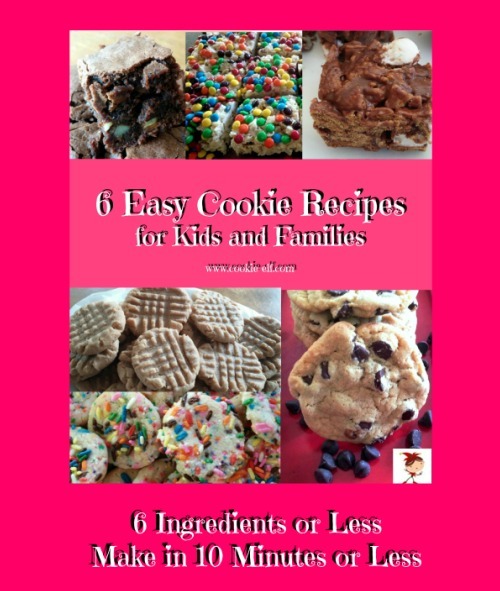 Sign up below and we’ll send you a link to get your own copy of 6 Easy Cookie Recipes. I promise to use it only to send you The Cookie Elf File. The Cookie Elf File #194: Lemon Wedding Cookies - Light, Sweet, Simple! The Cookie Elf File #164: The Easiest Christmas Sugar Cookie Recipe Ever! Read previous editions of The File in the links below. Happy baking! The Cookie Elf File #35: Cranberry Sugar Cookies - Just 3 Ingredients! The Cookie Elf File #33: Easy Snickerdoodles - Just 4 Ingredients! It's easy. It's fun. Everyone can do it.